Download the Murrplastik Universal Robot Dress Pack datasheet here (PDF format, 172 KB). Fluid Power Engineering carries a variety of Murrplastik products, from cable entry systems to custom robotic solutions. Murrplastik is able to provide fully populated robotic dresspack solutions for any robotic application, utilizing universally applicable fastening, conduit and protection elements for hydraulic, pneumatic and electronic cables and wires for all standard robots. They assemble and ship these dress packs, including their cables, connectors, and other content as one unit, making ordering and assembly at the job site easy. You can get more general information about Murrplastik robotic dress packs here. 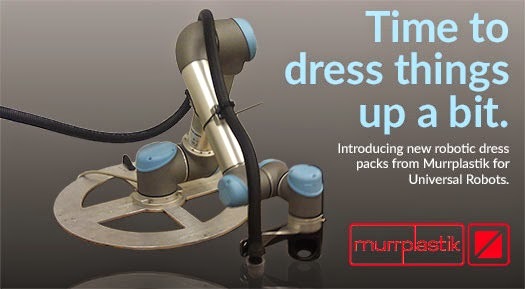 Murrplastik announced that they have created three new robotic dress pack designed to work with a Universal Robot. They're versatile, and work with both the UR 5 kg and 10 kg robots. The dress packs will keep cables and hoses protected and organized. They come with all the parts and hardware needed to mount to the robot. View the components of the dress pack here.